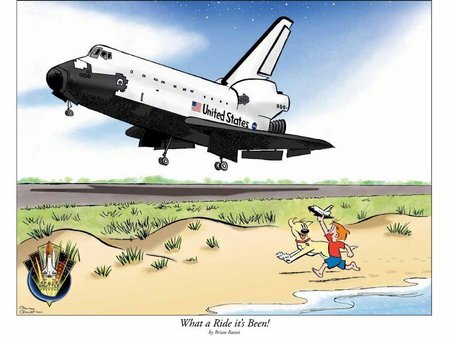 WASHINGTON — Comic strip artist Brian Basset has created a drawing depicting his characters, Red and Rover, racing alongside the space shuttle as it lands for the final time. After 30 years and more than 130 missions, NASA’s space shuttle fleet will retire later this year. A poster commemorating the Space Shuttle Program’s 30th anniversary will feature Basset’s cartoon and a patch selected as part of a contest among NASA employees to honor the program. Basset, a supporter of space exploration, created “Red and Rover” in 2000. A comic strip with a retro feel, it is about the unconditional love between a boy and his dog. The pair often dreams of going to space together. Nominated by the National Cartoonists Society for Best Comic Strip of the Year in 2003 and 2010, “Red and Rover” appears in more than 160 newspapers worldwide and syndicated by Universal Uclick. In 2004, Basset became the only cartoonist to have his space-themed comic strips displayed at NASA’s headquarters in Washington. On July 26, 2005, Basset’s original drawing commemorating NASA’s return to flight after the Columbia accident launched aboard shuttle Discovery on the STS-114 mission.